Last week, I was at the stage where I was still using herringbone to stitch flat the seams. This task is now thankfully done. Once I had the the quilt top assembled it was time to add the border. Normally a contemporary quilt is made of quilting cottons. 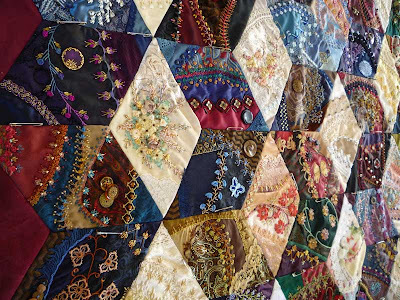 This is not the case with crazy quilts, as all sorts of materials can be used. 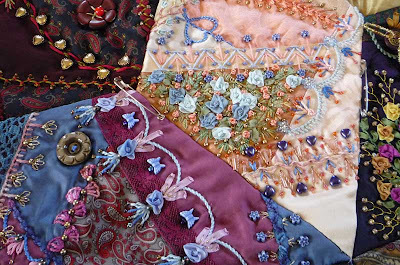 Not only a huge range of luxurious and highly textured fabrics available to the modern crazy quilter but also buttons, charms and beads are often added. This makes for a heavy piece of work, so when assembling the quilt this aspect of crazy quilting has to be thought about. 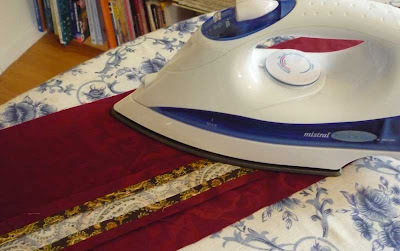 Since I like to embellish my quilts and my blocks are often heavy I chose a maroon cotton brocade for the fabric used in the border. It is a firm, solid curtain fabric. I wanted a strong fabric to both support the quilt and balance the weight of the blocks aesthetically. I mentioned last week I was going to have a inner border and binding is a burnt gold paisley. 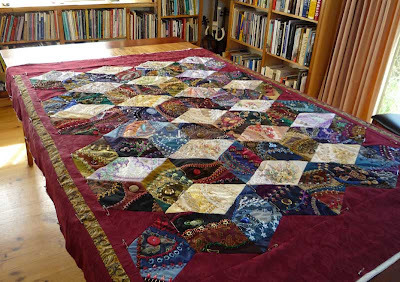 When piecing the diamond blocks I used paisley patterned fabrics throughout and I was delighted to find a quilting cotton of a burnt gold pattern paisley. 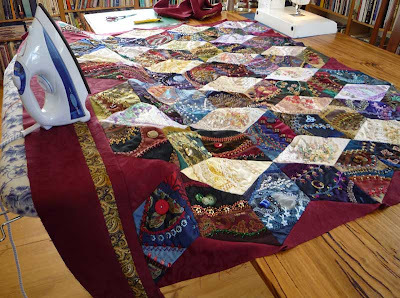 The only issue was that the quilting cotton and the maroon curtain fabric are two very different weights. To solve this I doubled the quilting cotton. In the photograph I have opened it up so you can see how it is simply two layers of the fabric. 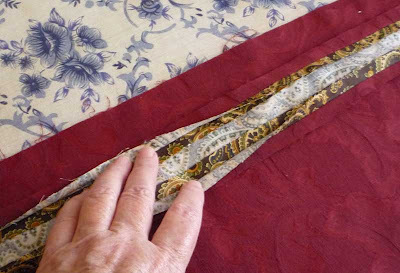 This evens up the weight of the fabric in the border. Obviously I treated the double layer as if it was the same as a single layer and other that that I used standard quilting techniques to create and attach the border. This is a subtext for lots of pins and lots ironing! I pushed the ironing board against the table so that the table takes the weight of the quilt as I iron the border. Once I was working with the quilt top I did change my mind about a inner border. Instead I decided a line of the paisley fabric running down each side of the quilt looked better. I liked the way these lines visually lengthened the quilt. Once the border was on, I created the quilt sandwich. I laid out the backing, the bamboo batting (which I have not used before but so far it is performing wonderfully) and the quilt top. I used quilters pins to hold the quilt sandwich together. Because many of the fabrics will leave a pin mark I make sure the pins are used on the seam line. I then start the very long process of tying the quilt top to quilt back. Tying the quilt together will stabilise and strengthen the quilt so although it is a long process I take time to do it well. 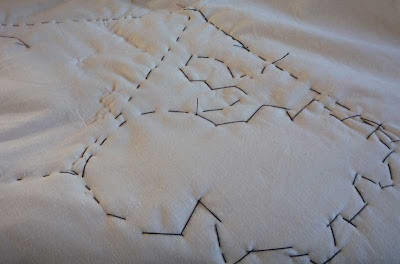 Since originally crazy quilts were not quilted I like to have no stitches visible from the front of the quilt. How do I do this? 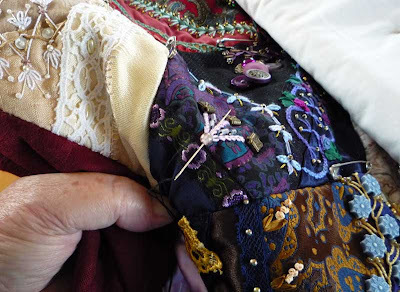 I hide the stitches behind buttons and larger beads. This is a stitch that comes from the back of the quilt, the thread travels through the bead, and I take the thread to the back of the quilt. In the process this hides that fact that the quilt is tied. I take the thread along to the next largish bead or button and repeat. I do this all over the quilt top. 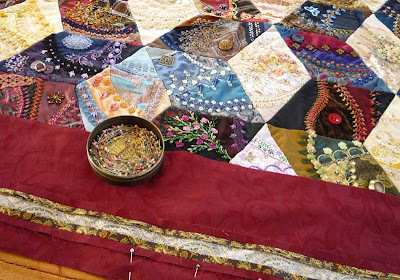 This process means that often threads are taken an inch or two across the back of the quilt. This is quite messy so I hide all this work with a false back. This looks messy but I hide all the mess behind a false back. The false back also adds strength but I will talk more about this next week if I am at that stage. Well, I have quite a bit of this still to do so I had better get on with it! 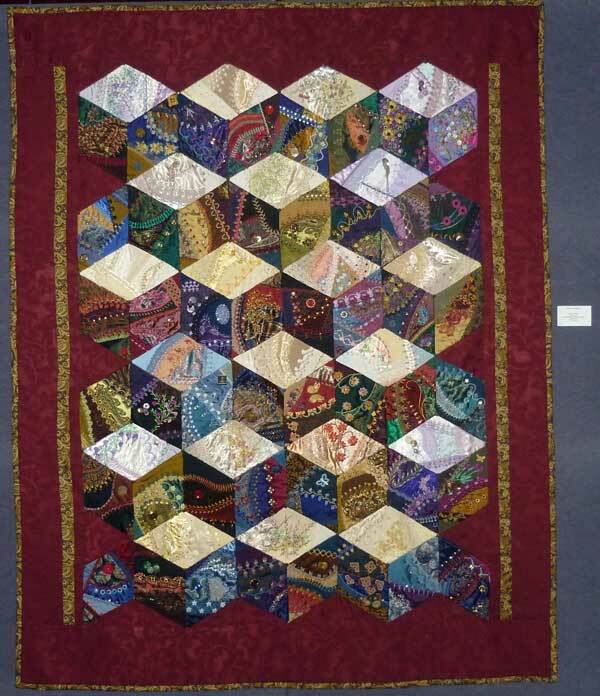 Sharon, your crazy diamond quilt is gorgeous, and shows the love of your craft and patience that has gone into it. Hi Allie what is the "the first fun thing I will embroider" actually I wont my fingers are raw! I have not got in the garden for 3 weeks and we have had rains. Since it is spring her the weeds are already 6 inches high and literally daily growing. I have never had such a messy yard – so it will be garden blitz time. Unfortunately I think that blitz is at least 10 days away and the yard will be in worse state. Never mind both tasks will be satisfying when done. Beautiful! The diamonds were lovely by themselves, but all together and with the borders added, they are gorious. Also want to say "thanks" for sharing the stitching sampler, I have many embroudery stitch books, but you’ve went way beyond their examples of combining stitches, and adding other embellishments. It is looking truly amazing Sharon-I can’t wait to see it in the flesh. Taking all the time necessary at this juncture is KEY! Wonderful to see you doing right by your masterpiece here. Wow! This is a very impressive piece of work. You must be thrilled with it.